The smartphone war is on in this week’s Adweek/VidIQ top 10 branded video chart. Samsung’s attempt to inject itself via digital marketing into competitor Apple's launch announcement of the new iPhone 6 phones last week nabbed the marketer four spots on the chart, while Apple grabbed two spots on the chart. Samsung’s No. 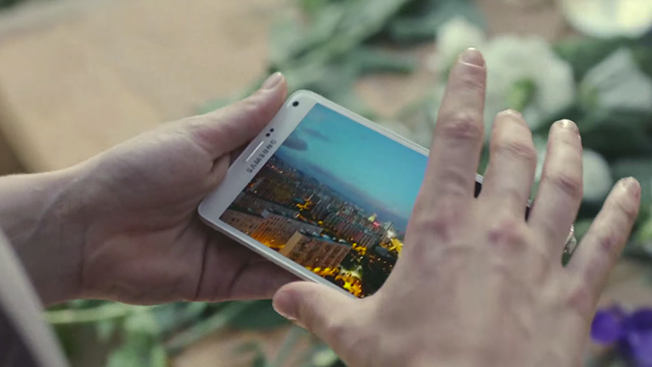 1 spot, which promotes the upcoming launch of the Samsung Galaxy Note 4 is more like a mini-movie than a commercial (it even includes credits at the end). The clip is nearly four minutes long and shows off how all of the phone’s features are actually used by consumers—a tactic that Apple has been using for years. Since being uploaded on Sept. 3., Samsung’s video has garnered 19.4 million views and more than 13,000 Facebook and 1,430 Twitter shares. Two of Samsung’s other top videos this week (one of which includes a paid media push) break down the phone’s multitasking and stylus features with similar scenarios showing how Samsung’s features work in real life. Collectively, the two ads have garnered roughly 19 million YouTube views, more than 2,000 Facebook shares and 263 tweets. Samsung’s final video this week is a demo video introducing its Samsung Gear S smartwatch, which has generated 4.9 million YouTube views and more than 4,000 shares. In addition to its digital videos, Samsung also bought a Trending Topic ad on Twitter on Sept. 9, the same day as Apple's announcement. Trending Topics cost $200,000 for a one-day placement. Apple’s lengthy but predictable video touting its bigger iPhone 6 phones took the No. 10 spot this week. And, the Cuppertino, Calif.-based company’s 30-second TV ad placed at No. 8 on this week’s chart. Check out all of this week’s videos in the VidIQ-powered infographic below.